At Toxic Custom we design and fabricate many custom one off parts in-house for our many projects, but we can also help with any type metal, fiberglass, or plastic fabrication project that you might have. 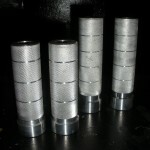 These are some custom made front and rear foot pegs / rest that we keep in stock. These foot rest are $49.95 per set. This is a 300 swingarm that we made for a Yamaha R1. 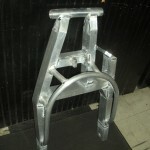 Prices start at $750.00 for our 240 swingarm.